Linear shower drains are drains that create a one-way slope to a single line extending completely between two vertical surfaces. There are two basic kinds of linear drain supplied on the market now. One brings about the look of a linear drain possible with a decorative cover but still keep the old two-part clamping ring drain system underneath. It adds more labor to install and is not so efficient. Another kind of linear shower drain includes a body underneath with a waste outlet connecting directly with the plumbing. Linear shower drains on BuilderElements.com not only look like linear drains but are indeed linear drains. They are with various beautiful patterns and functioning efficiently for years. Linear shower drains on BuilderElements are all superior handcrafted. They are with the highest quality and supplied in many styles/patterns to match your home decor and remodeling project. They are made of 304 stainless steel to ensure their durability and long lasting use. Their satin polished finish let them have smooth surfaces, safe drainage and high hygiene. How do I install linear shower drains? We offer detailed and instructional installation guide for you to avoid installation mistakes and let the installation process easy in almost any kind of construction or remodeling project. 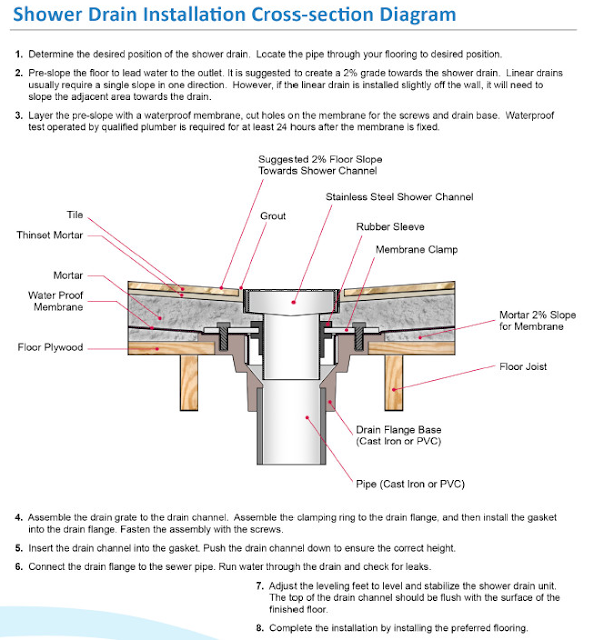 Compared with traditional shower drains, linear shower drains on BuilderElements.com only require simple 2D grading of the floor towards the channel and can be used with any type of tiled shower configuration.